I’m telling you this because at the meeting we will be discussing many topics in terms of how to ensure that patients get good value from health care spending and that we are all working together toward a more integrated system. 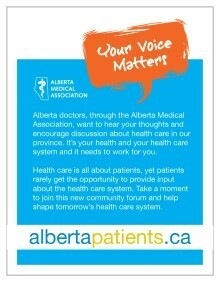 The Board is aware of the work that albertapatients has done in the past few years and have asked me to share some of the input that you have given us with the RF to inform its discussions and advice to the Board. The Board is so proud of this community. Your efforts as members are really and truly valued. It means so much that you stick around to answer our calls to participate in surveys, to send us emails or add to online discussions. We believe you are providing some of the most valuable and timely insight on health care that is being collected anywhere. We’ll be back in the year ahead to get more insight for the Board. We need to know what patients think as we move through big and often evolving discussions. Please stay with us and keep that input coming. In this newsletter, we feature results of a survey on seniors care. It repeats a number of questions we’ve asked before so that we have the most-current pulse of patient opinion in this area. We also added some questions about end-of-life care and your perspectives on where you think that care should occur and how it should be delivered. Enjoy the reading, look out for more activities ahead and, again, on behalf of the AMA Board and the Representative Forum: Thank you! In February, we asked albertapatients members for their perspectives on issues related to aging and health care, along with questions related to “End of Life Care” in Alberta. Please read on to the Did you Know section (below) for highlights from that research and a link to the full report. Views on aging, health care and end-of-life care. Am I old? How old do you have to be to be considered "old"? There’s no “right answer” to this question, but perceptions about aging, vitality and longevity tend to push these answers up with each successive generation. A hundred years ago, life expectancy in Canada was ~60 years of age – today most people don’t even consider that “old”. Aging and retirement are supposed to be one’s “Golden Years”, but aging is also a source of anxiety for many people. Financial security and health are the two top concerns people have as they age and contemplate retirement. 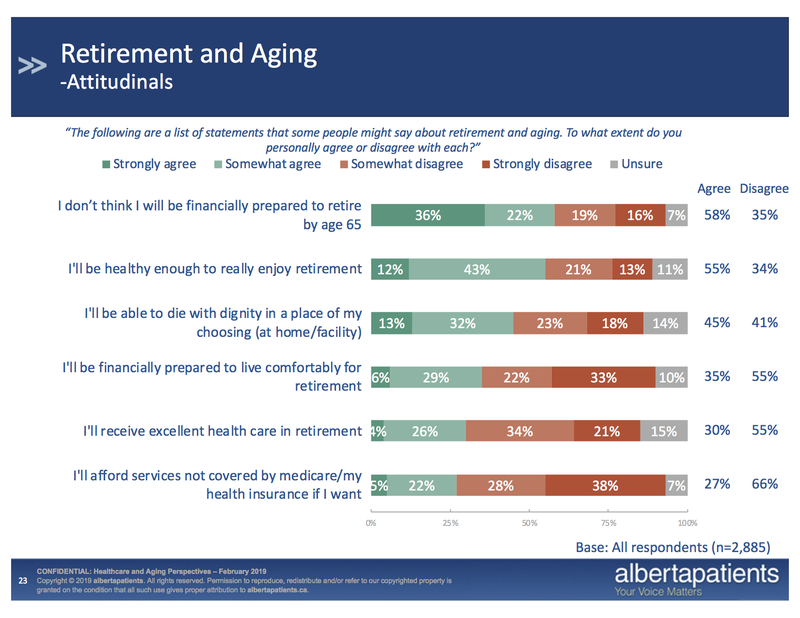 While a majority of albertapatients (55%) feel they will be healthy enough, financial stability is a greater concern – fully 58% say they don’t think they will be financially prepared to retire at 65, and 55% don’t believe they will have the finances to live comfortably in retirement. 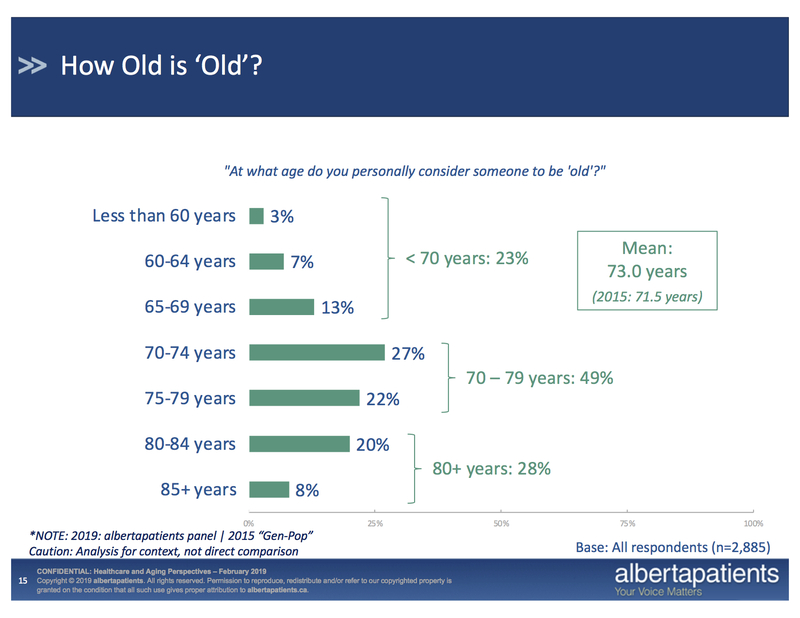 Albertapatients are also concerned about the health care they may receive as they age. Over one-half (55%) disagree with the statement “I’ll receive excellent health care in retirement”. 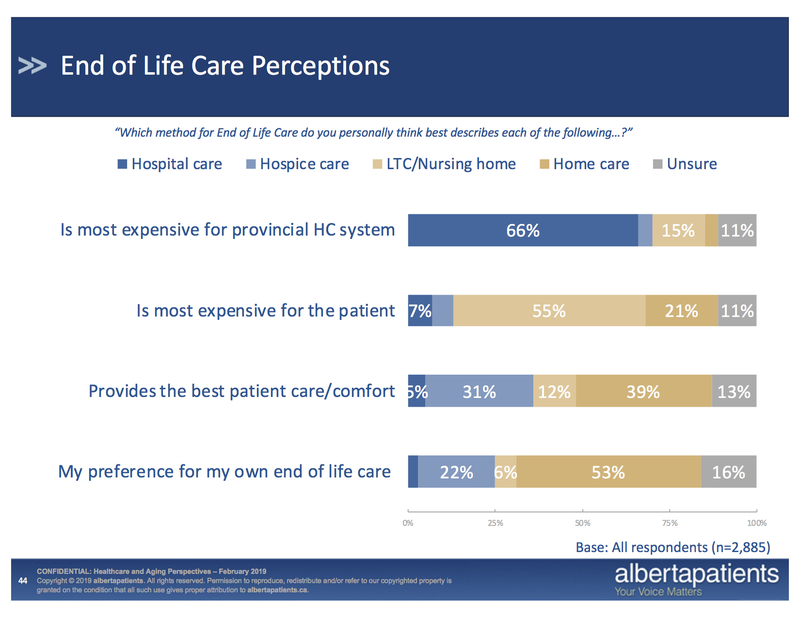 These impressions are likely informed in part by perceptions of how older Albertans are treated in the province’s health care system, but also have some linkages to financial uncertainty. Two-thirds (66%) disagree that they will be able to afford services not covered by Medicare/insurance in retirement. While a plurality of albertapatients (45%) believe that they will be able to die in dignity, in a place of their own choosing, nearly as many (41%) tend to disagree. Our February survey probed a bit deeper on this issue, looking at perceptions and expectations related to “End-of-Life Care”. From a patient’s perspective, most (53%) would prefer to spend their final days in their own home, with another 22% saying hospice care and 6% in a long-term care home. Only 3% say they would prefer to die in a hospital. Anecdotally, these preferences and perceptions are not well aligned with general practices with end of life care in the health care system today. It suggests examining funding models and practices related to end-of-life care may offer an opportunity to provide better care to patients AND potentially savings for the health care system itself.